How Was Your Deer Season? That is a common question here in the mid-west. For many of us the answer is “not so good.” Although as a state we still managed to harvest about the average number of animals it was a tough go for many hunters, myself included. First my son decided we’d better hurry up and get an old one man tower blind renovated while I was shooting the 600 yard IBS Nationals. That ended up requiring a little more engineering than we anticipated thus more time. Then in the move to its final location a base leg became a casualty and needed to be replaced. Another delay. But to his credit said son made all the necessary modifications and repairs without the help and guidance of Dad. Although I figured it would probably fall over since I wasn’t there to help, it has remained upright. 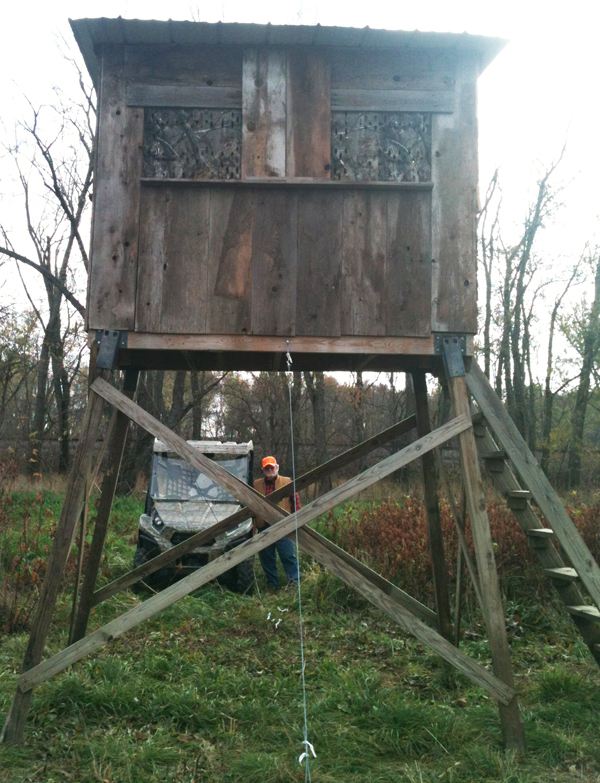 So we had the tower up and ready and the Deer Shack on Tree Island was in good repair, bring on the season. It was still early so I hiked in and put the skirting on my tree stand and installed a nifty camo seat cushion and that stand was ready. Earlier in the fall, with the help of the Missouri Valley College Wrestling Team we planted 1200 trees on the north side of the farm. The preparation for this required a very close mowing the effects of which wouldn’t be known until later. The stage was set, let the scouting begin. Unlike years past, our cameras didn’t divulge any secrets and no big bucks. Uh oh, this doesn’t look good. There was plenty of buck activity however and it became habit to take a shovel with you any time you went to the north side. The bucks were horning every sapling they passed! Finally opening day is here. The weather is warm, too warm, full moon with clear skies and wind. So I get up way before the local chickens and stealthily sneak to my previously skirted tree stand which was easy to do with a full moon that was nearly as bright as the mid-day sun. Wind direction was okay but at this time of the morning it wasn’t anything other than a very light breeze. As I climbed my ladder hopefully to near instant success, I marveled at the comfort level I was experiencing temperature wise. I finally got done squirming around like a teenager on his first date just as first light was appearing. I had a chip on my shoulder for any buck that MIGHT have been responsible for causing me all that shovel time earlier (and later, as it turned out) replanting trees. But our county is a 4 point to a side county so the smaller bucks were safe for now. As the sun rose so did the wind and before long I was swaying back and forth in my tree which I thought was a pretty good sized tree. The later in the morning it got the more windy it got and by 9 AM I was hanging on for dear life and flapping in wind like an old flag. It was time for me to be on the ground by choice not by accident so I climbed down happy to be stable again. I had seen a small buck and a few birds and that was it. As I trudged back to my truck breakfast was sounding pretty good. The wind was relentless and I did go back out that afternoon and stayed way past dark just to see what there was to see. The wind dropped briefly about dark but came back a short time later with a vengeance. OH, and yeah … there wasn’t anything so see then either. The next day was a repeat but I didn’t stay in the tree as late but found a comfortable hiding spot and still didn’t see anything but I got a great 20 minute power nap in. I texted my wife that breakfast was in order if she wanted to meet me after church which was agreeable with her. After making sure the Chiefs were recorded I went back to stand vigil ’til darkness chased me home. I did finally see some deer, all does, but they were deer. If the girls are there the boys aren’t far behind. But that ended my first week of the 2013 deer season. Monday through Friday I was back on the phones at Sierra and hearing all your success stories and to tell ya the truth I didn’t miss the flapping in the breeze part. The second Saturday was cooler and not as windy. Although I did finally see a small buck chasing a doe he didn’t have any samplings hanging from his small rack, so he escaped the wrath of the “shovel guy.” That afternoon I just hung out. I had a gun, but would have preferred to see a coyote in my cross hairs more than a deer. As it turned out I did discover that the deer had changed their habits slightly and moved a short ways north presumably due to the disruption of there habitat when we mowed the north field. I was at it again Sunday morning but my wife was sure that I was going to be a heathen because I didn’t go to church. I’d probably agree to the heathen part but that came years earlier and she knew that. It was just a point of conversation. Cold and a lack of interest chased me out of my tree about the time early church was over so I texted a breakfast invitation to son and daughter-in-law and my wife. I got no immediate takers, but they came around eventually and I found out there hadn’t been much going on anywhere. Hadn’t even heard many shots BUT we think our one big boy got harvested by a neighbor to the west. So … that’s how my season went, what about yours? 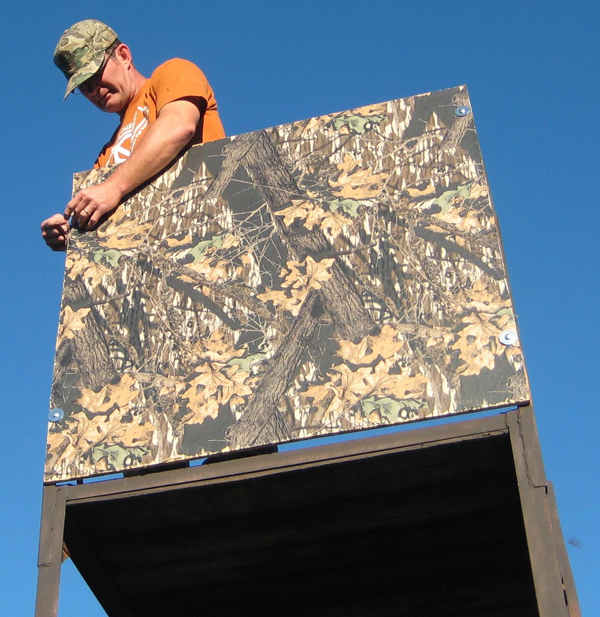 This entry was posted in Hunting Stories and tagged deer hunting, deer season, deer season preparation, deer shack, deer tower, hunting tower, Missouri bucks, Missouri deer season. Bookmark the permalink. 1 Response to How Was Your Deer Season? My deer season, hum? How should I put this, how about Awesome! Oh I didn’t get anything, but I saw a few big Mule deer. I was using a Longbow for deer and just kept getting busted by the wind. Now on to Elk season, I hunted it with my Savage Striker with the .308win barrel on it. And again, I didn’t get anything. It was just one of those years. Nobody else got one in my unit that I talked to. They just did seem to be around this year. The only elk I saw was one.that ran across the road infront of me after dark on the way home. So that was the way my season went. But just wait til next year! !